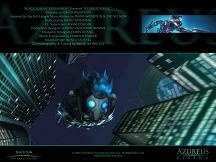 Azureus Rising is a film short which has been made as a proof of concept. If all goes to plan then this will become a feature film trilogy. In the film short we see Azureus who is a young freedom fighter, mostly hidden behind a suit of body armour but with a mane of blue hair blowing in the wind. In a futuristic city he battles against laser guns, robots and flying machines. He is armed with hand-guns and a sword, but he needs all his fighting skills and reflexes when he meets a giant robotic and heavily armed scorpion. You need to see the film to understand what "Azureus Rising" is all about, so here is the film on YouTube. To find out more about the film project, visit the website at www.AzureusRising.com. I think you will agree that the graphics and action look amazing, and that the short will translate very well into an animated movie on the big screen. Equally stunning is the soundtrack by Edwin Wendler. (Visit the composer's own website at www.EdwinWendler.com.) Like many blockbuster films this has been scored for a traditional orchestra augmented by electronic effects. Not having the budget of a major film, the orchestrations have been recorded entirely using samples, but the quality is excellent and the complete soundtrack including a suite of alternate versions has been released for free download. We are pleased to offer the digital downloads below. You can also download the Digital Booklet. Tell us about how you got involved with Azureus Rising. I’ve always been a fan of visual effects. As a kid, I owned books about how they were done; they’ve just always fascinated me. So I was on Facebook one day, looking for fan pages about visual effects companies, and David Weinstein’s profile picture popped up on one of those pages. It didn’t show David’s actual face, but a character that he had designed: a troll. It instantly caught my eye because it wasn’t just a monster, it was a character. There was a story behind that face, with its wrinkles, and the expression in its eyes. So I sent David a friend request and looked at his company’s website. It listed Azureus Rising as being in production, so I sent an email asking if they were still looking for a composer. David told me later that when he got that email, he thought that somebody had sent it to him as a joke, or to cheer him up, because it arrived only days after another composer had left the project. David must have liked my previous work because he agreed to meet. What attracted you to Azureus Rising? During our first meeting, David showed me some character drawings and a fully-rendered portion of an early sequence. I had never seen anything of that quality and detail, coming from an independent production company. I felt that composing music for images like that would take me back to my childhood, when I was playing with my action figures, listening to some exciting film music. It ended up feeling like that, only much better. Tell us about your role as Composer on the project. What was the step-by-step process? David and I first talked about what the music should sound like. David felt strongly about avoiding excessive use of electronics. It was clear to me that he wanted a serious film score, not something that you would hear at a nightclub. I strongly felt that our protagonist Azureus needed a musical signature, something darkly heroic. So, the first thing I wrote was the opening, when Azureus jumps into the city. When he lands, time seems to freeze for a moment, and I thought that that was the perfect opportunity to introduce his theme. David loved it, so that became the backbone of the entire score. I continued writing whenever David and his team completed a section of animation. That can take a long time, especially when you have a limited budget and a small team, but David kept pushing, and every time I got updated picture from him, I got more and more excited and inspired to write music that would be on par with the high quality of the images. Over the course of a few months, I added music, revised it, adjusted it to new picture, etc. Tell us about your use of instrumental colors. What kind of influences did you draw upon? Genre scores such as The Matrix by Don Davis and The Dark Knight by Hans Zimmer and James Newton Howard were obvious influences. I made sure, though, to not copy anything but to take colors and elements of those scores and add a few touches of my own. The use of ethnic percussion was very important to me. It is part of Azureus’s theme when he lands in the city, and after the huge explosion in the end, when he walks away, but the ethnic percussion is also playing in every action scene, along with some traditional, orchestral percussion. Staccato (short) strings are often playing a repeating rhythmic figure which goes through a couple of variations as we move from one scene to the next. We first hear it when we see the city wall in the beginning, and it also concludes the score during the final measures of the end credits. Brass is mostly used for the hero theme and some dissonance during action scenes. At one point, I used some crazy ethnic woodwinds to accompany a missile launch. I felt that that moment needed a touch of insanity, and I’m glad that David liked it because it was a bit risky and out there. What’s your composing process like? Do you sit at a piano and improvise while watching the movie? I watch the movie like an audience would. I react viscerally and somehow translate that reaction into music. Rhythm is very important to me. Tempo is what guides me through a scene. I identify the moments that music needs to hit. Once I can hear the music in my head, I sit down at my sequencing computer and play each musical part until the whole arrangement is recorded. As you can image, that is quite time-consuming, though not as time-consuming as animation! Do you have a favorite musical moment in Azureus Rising? I had a lot of fun with the scorpion fight but my favorite moment has to be the “building surfing” scene when Azureus dives into the skyscrapers and glides along on the corners of the buildings. It’s such a fantastic moment of heroism but there’s something poetic about it as well. I used a choir there which sings Latin lyrics from Virgil’s Aeneid, stuff about swords and gutted towns. I thought the text was fitting, and the use of choir is always special, if used sparingly. Did David Weinstein have any specific requests about specific shots? In general, he pretty much trusted me to add the kind of excitement that only music can add. Whenever something needed to be adjusted or re-written, David always communicated clearly what feeling he wanted there to be, at specific points. Music is very difficult to talk about because it is so abstract in nature, but David gave me exactly the kind of feedback I needed because he was describing emotions, rather than talking about musical instruments or chord changes. Any particular inspirations or artists you feel have an influence on your work? I love film music that is accessible and complex at the same time, while also perfectly serving the dramatic needs of the picture. I would say that all successful composers have reached that point more or less. Of the composers working today, I most admire John Powell, Thomas Newman, Danny Elfman, Elliot Goldenthal, Hans Zimmer, and John Williams, of course. My mentors, Paul Haslinger and John Ottman, have had a very positive influence on my development as a composer. Are there any limitations you had to face on Azureus Rising? Creatively, absolutely no. I pretty much felt like a kid in a candy store all the time. The one thing that would have been absolutely fantastic would have been to have the budget to hire a full symphony orchestra. I have been told by many people that my orchestral emulations come pretty close to the real thing but I have worked with “real” orchestras before, and there’s nothing quite like it. 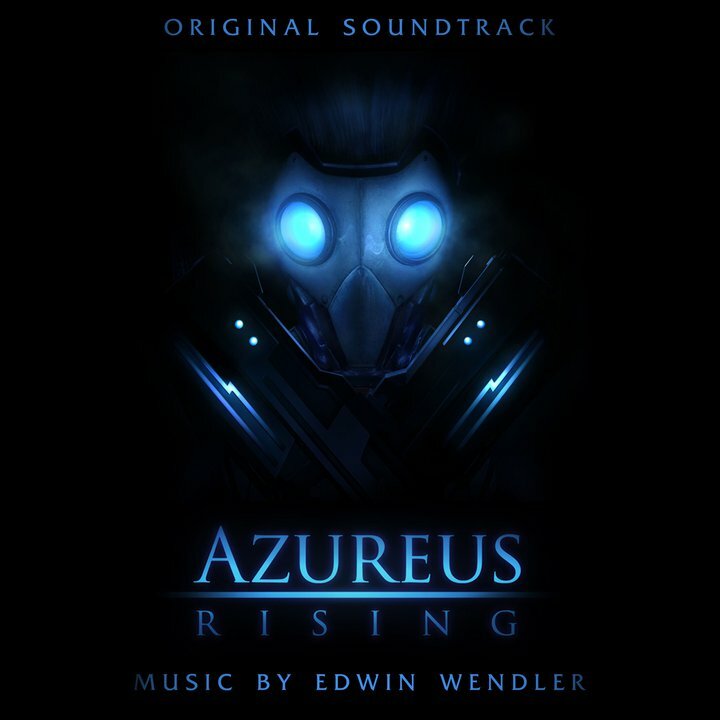 Will there be a soundtrack album for Azureus Rising? Anything in particular you might like to add? This has been a dream assignment for me. It’s very clear that everybody on Azureus Rising brought an enormous amount of passion to the table, along with some amazing craft, skill, and artistic vision. Thank you so much, David, for giving us such a fantastic project to work with!